De Haar Castle (Dutch: Kasteel de Haar) is located in Utrecht, Netherlands, near the village of Haarzuilens. The current buildings, all built upon the original castle, date from 1892 and are the work of Dutch architect P.J.H. Cuypers, in a Neo-Gothic restoration project funded by the Rothschild family. The oldest historical record of a building at the location of the current castle dates to 1391. In that year, the family De Haar received the castle and the surrounding lands as fiefdom from Hendrik van Woerden. The castle remained in the ownership of the De Haar family until 1440, when the last male heir died childless. The castle then passed to the Van Zuylen family. In 1482, the castle was burned down and the walls were torn down, except for the parts that did not have a military function. These parts probably were incorporated into the castle when it was rebuilt during the early 16th century. The castle is mentioned in an inventory of the possessions of Steven van Zuylen from 1506, and again in a list of fiefdoms in the province Utrecht from 1536. The oldest image of the castle dates to 1554 and shows that the castle had been largely rebuilt by then. After 1641, when Johan van Zuylen van der Haar died childless, the castle seems to have gradually fallen into ruins. The castle escaped from total destruction by the French during the Rampjaar 1672. In 1801 the last Catholic van Zuylen in the Netherlands, the bachelor Anton-Martinus van Zuylen van Nijevelt (1708–1801), bequeathed the property to his cousin Jean-Jacques van Zuylen van Nyevelt (1752–1846) of the Catholic branch in the Southern Netherlands. In 1890, De Haar was inherited by Jean-Jacques' grandson Etienne Gustave Frédéric Baron van Zuylen van Nyevelt van de Haar (1860–1934), who married Baroness Hélène de Rothschild. They contracted architect Pierre Cuypers in 1892 to rebuild the ruinous castle, which took 15 years. In 1887, the inheritor of the castle-ruins, Etienne van Zuylen van Nijevelt, married Hélène de Rothschild, of the Rothschild family. Fully financed by Hélène's family, the Rothschilds, the couple set about rebuilding the castle from its ruins. For the restoration of the castle, the famous architect Pierre Cuypers was hired. He would work on this project for 20 years (from 1892 to 1912). The castle has 200 rooms and 30 bathrooms, of which only a small number on the ground floor have been opened to be viewed by the public. In the hall, Cuypers placed a statue with his own image in a corner of the gallery on the first floor. The castle was equipped by Cuypers with the most modern gadgets, such as electrical lighting with its own generator, and central heating by way of steam. This installation is internationally recognized as an industrial monument. The kitchen was for that period also very modern and still has a large collection of copper pots and pans and an enormous furnace approximately 6 metres long, which is heated with peat or coals. The tiles in the kitchen are decorated with the coats of arms of the families De Haar and Van Zuylen, which were for this purpose especially baked in Franeker. Cuypers marked out the difference between the old walls and the new bricks, by using a different kind of brick for the new walls. For the interior Cuypers made extensive use of cast iron. In the castle one can see many details which reminds one of the family De Rothschild, such as the Stars of David on the balconies of the knight's hall, the motto of the family on the hearth in the knight's hall (A majoribus et virtute) and the coat of arms of the family right underneath on the hearth in the library. The interior of the castle is decorated with richly ornamented woodcarving, which reminds one of the interior of a Roman Catholic church. This carving was made in the workshop of Cuypers in Roermond. The place where later also the interiors of many Roman Catholic churches were made, designed by Cuypers. Cuypers even designed the tableware. The interior is also furnished with many works of the Rothschild collections, including beautiful old porcelain from Japan and China, and several old Flemish tapestries and paintings with religious illustrations. A showpiece is a carrier coach of the woman of a shōgun from Japan. There is only one more left in the world, which stands in a museum in Tokyo. Many Japanese tourists come to De Haar to admire this coach, which was donated from the Rothschilds' collections. Surrounding the castle there is a park, designed by Hendrik Copijn [nl], for which Van Zuylen ordered 7,000 grown trees. Because these could not be transported through the city of Utrecht, Van Zuylen bought a house and demolished it. The park contains many waterworks and a formal garden which reminds one of the French gardens of Versailles. During the Second World War many of the gardens were lost, because the wood was used to light fires, and the soil was used to grow vegetable. At this time, the gardens are restored in their original state. For the decoration of the park, the village Haarzuilens, except for the town church, was demolished. The inhabitants were moved to a place a kilometre away, where a new Haarzuilens arose and where they lived as tenants of the lord of the castle. This new village was also built in a pseudo-medieval style, including a rural village green. The buildings were for the most part designed by Cuypers and his son Joseph Cuypers. From 2000 on, the estate is partly owned by Natuurmonumenten. The colours of the family Van Zuylen are red and white. The coat of arms consists of three red columns on a white field. The different branches of this family differ slightly on these colours. This coat of arms does not only live on in the colours of the castle, but also in nearly all of the houses of Haarzuilens, even in the newly constructed ones. In 2000, the family Van Zuylen van Nyevelt passed ownership of the castle and the gardens (45 ha) to the foundation Kasteel de Haar. However, the family retained the right to spend one month per year in the castle. In the same year, the Dutch society Natuurmonumenten bought the surrounding estate of 400 ha. An extensive restoration programme of the castle and the gardens was initiated in 2001 and was completed in 2011. The castle terrain is regularly used for fairs and markets, such as the Elf Fantasy Fair. ^ Kransberg, Doriann; Mils, Hans (1979). 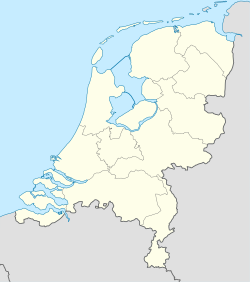 Kastelengids van Nederland. Middeleeuwen (in Dutch). Bussum: Unieboek. pp. 78–80. ISBN 90-228-3856-0. ^ "Foundation Kasteel de Haar". Archived from the original on 30 August 2009. Retrieved 4 September 2009. ^ "Restoration programme". Archived from the original on 26 July 2009. Retrieved 4 September 2009. Wikimedia Commons has media related to De Haar Castle. This page was last edited on 18 March 2019, at 13:36 (UTC).